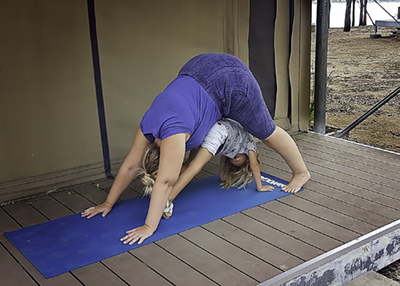 Sandi gets playful on the yoga mat with her young niece. Two weeks ago I set out on a quest to conquer forty days of home yoga practice. It wasn’t something I had ever really thought I could or would do. However, after reading Kara-Leah Grant’s book, Forty Days of Yoga, I felt compelled to start. I am now two weeks into my journey and this is what I have discovered so far. 1. Yoga may not change my life experiences, but it can help me to deal with them. This past week I have been dealing with a range of emotions over the death of a friend. It has been a time of great shock and sadness, as well as anger over the fact that she was too young and it was so unexpected. Yoga has helped me to breathe through these emotions as they arise on a daily basis. 2. I have a calmer mind. I can now use my breath outside of my yoga practice to help minimize stress, pain, anxiety and sadness. 3. I appear to be less reactive to situations, and more able to take things in my stride. This is a huge benefit in my life with three sons, a husband, and a puppy! 4. I am more accepting and forgiving of others. My friend’s family decided to have a closed family funeral. This was very confusing to me and a lot of my friends at first. We all wanted to show our love for her and celebrate her short life. We wanted to share our grief together. But I came to realize that a small funeral was what her family truly needed. I accepted and was OK with that because I’m learning that we all must follow our own path, and we all grieve in different ways. 5. This leads on to being more accepting and forgiving with myself. I put aside those mean voices and I spent time searching for photos and writing some memories of my life with my friend. I met up with some old friends and we marked and celebrated her life in our own way. I feel I’ve ignored my needs for so much of my life…..doing what I think I should do, but I don’t want to do that anymore. I want to be me! I want to accept who I am and how I need to process events in my life. I want to stop denying the emotional side of myself. Yoga is helping me find some space to realize that I don’t have to do what the negative voices in my head tell me to do all the time. I am hoping I can find a sense of balance with all the commitments I have in my life right now. 6. In just two weeks, yoga has given me a sense of emotional freedom. I was lying in savasana the other morning and I had the clearest vision of huge metal shackles being released from my arms and legs. I felt a weight lifting off my chest. My breath filled me with a huge sense of freedom once the shackles had been released. I can still tap into that feeling now. I have noticed a hugely increased range of movement in my shoulders, my hips, my chest, my legs and even, I believe, my heart! I would never have believed I could come this far in only two weeks. 8. My bowels have moved better. It’s something we don’t normally talk about, but yoga is getting my sluggish digestive system back in order! 9. I am more curious. As I was practicing earlier this week, I kept getting a feeling that something was happening in my hips, so I looked up which poses were best for opening my hips and incorporated them into my practice the next day. The same happened with my thyroid problem. I read that shoulder stands could be good for thyroid stimulation so I learned poses to warm myself up and get into a shoulder stand again. (It’s been a few years since I’ve done one!) This new sense of curiosity has helped me to connect with my inner self and wellbeing again as I start to come out of the robot mode that I have been living in for that last eight years. 10. Finally, I have become more playful. I laugh a little easier, I definitely smile more. I can play a bit more on my mat and explore what feels right. I’m not so regimented and strict about the perfect way to do things. I’m learning that there are many ways and that no way is the right way for everyone. I’m learning to let go a little and to love and accept my inner child again. I never dreamed that two weeks of daily yoga could lead me to experience so many emotional and physical changes. I know that the journey ahead might not always be so positive, but I’m looking forward to monitoring these new changes as I continue on my yoga and self-awareness journey. Sandi White is a portrait photographer based in Brisbane, Australia. She is a wife and mother to three young sons. She is also a wannabe yogi! 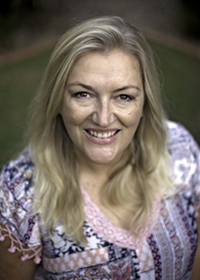 She has recently started writing a blog called Breath and Beyond where she shares the experiences of her growing passion for yoga. In her spare time, she loves to read novels and colour in. You can find out more at Breath and Beyond and Sandi White Photography.